This Emperor is a great politician of the rare, who trifled with the two great samurai who established the samurai regime. This Emperor continued to be top for over 30 years while using samurai, or being used. Was the Toba-in a painful choice? Was there a covenant with this throne? The establishment of the Kamakura Shogunate should be returned to 1192! Although Toba-in and Sutoku-in were always in confrontation, it seems that the same evaluation was given to Prince Masahito. The evaluation was extremely low, and it was evaluated as "There is no institution to imitate the Emperor", "There is no academic knowledge, there is no talent of the warrior, no ability, no artistic talent". Whether it's because of that, when Sutoku-in was Emperor, Toba-in nominate appointed him to be the successor was Emperor Konoe of 3 months old. Emperor Konoe is a younger brother twelve years old with Prince Masahito. Based on this evaluation and results, you can see that it was removed from the successor earlier. The son of Prince Masahito (later the Emperor Nijo) has been put away from the royal family in the temple. Prince Masahito not only himself but also the heir own itself was removed as a successor. That's why Prince Masahito was an obstacle. Also, there was a personal feeling of Toba-in. Shoushi, the mother of Prince Masahito, has a connection with Toba-in on the secret of the birth of Sutoku-in. Actually Shoushi will be able to get away from the Toba-in. Tokushi, the mother of Emperor Konoe, is one of the most loved Empress of Toba-in. I am jealous of this evaluation, in fact, Prince Masahito's tremendous ability, I am afraid that there were some scared places. Because, after becoming the Emperor, Prince Masahito (Emperor Go-shirakawa) will become a great politician who will fight a fierce political struggle later with Kiyomori Taira-no and Yoritomo Minamoto-no. Kiyomori Taira-no, Yoritomo Minamoto-no is a great samurai who establishes the samurai regime. In particular, I wonder if Toba-in remembered the Shirakawa-in which is the primary cause of inferiority complex. By the way, the name is also "Go" - "Shirakawa". In Japan there is a custom of giving names to deceased people. People of posterity will reflect the person's image of the deceased person in that name. That name is called "Okurina". Go-shirakawa is Okurina, so it will be proof that the posterity human beings are looking at those who are comparable to that monster politician Shirakawa-in. I wonder if the real evaluation of Emperor Go-shirakawa will be fully transmitted in this way? Incidentally, the name of the Emperor has many emperors named "Go" in front of the name of the Emperor who existed first. "Go (後)" has the meaning of "after". The Emperor with "Go" in the name said that he respected that emperor, that he wanted to be such an emperor, that he wanted to do politics like that emperor, or something It is attached to a person who has a relationship. Perhaps decades later "Go-Shouwa" or "Go-Heisei" emperor may appear. When the Emperor Konoe died, there was an opinion that the next Emperor should be Prince Morinhito (later Emperor Nijo) who is the son of Prince Masahito. Unlike his father, Prince Masahito, who was told that there was no qualification to become an emperor, Prince Morihito was said to have excellent wisdom. However, Prince Morihito was once put in a temple and was far from the royal family. He was as young as 12 years old. There was also an opinion that it is strange that he will jump over his father and lead him. So the prince Masahito will deceive the Emperor. After the age of 29 Emperor Go-shirakawa served. To the throne of the Go-shirakawa Emperor, there was a boost by Toba-in, Tokushi, Kanpaku Tadamichi Fujiwara. What they expected was to suppress Sutoku-in and to have a relay for the time being until the favorite Prince Morihiro crowned. It seems that there was a painful choice for this throne. Toba-in said that he did not want to choose either Emperor 's candidate Sutoku-in or Prince Masahito. Toba-in has a thick belief that took a life of not wanting to choose only Sutoku-in. Prince Masahito said that there was a problem in qualities so that approval of surroundings could not be obtained. The only applicable to the person's Prince Mohito, at that time is not a Prince to have been placed in the temple, and it was not even the royal family. Emperor can not serve young because it was expected that Sutoku-in is overwhelmed by power. When it comes to this way, there is no other than Prince Masahito who has problems with its qualities. As I said before, I have a question about Emperor Go-shirakawa 's problem of qualities. Is it necessary to remove his son from the prince and put it in the temple due to his qualification problem? Toba-in continued to be the top of politics for 34 years since he became Joko, 17 years of age of the Emperor and started Insei. I think that Toba-in felt that the ability of Prince Masahito threatened the position of Toba-in. Therefore, I think that the prince Masahito had crushed him while he was young. The reason why Prince Masahito could not agree with the surroundings is that Fujiwara clan thought it was an obstacle for the restoration of the Sekkan politics. This is my selfish interpretation, but I think that there was a covenant between Toba-in and Emperor Go-shirakawa. Instead of guaranteeing the return of Emperor Go-shirakawa and returning to the royal family of his son, it is a deal to suppress the rebuilding of Sutoku-in. Since it is almost impossible to prove the covenant, it seems there was a covenant after seeing the flow afterward. Also, since Emperor Go-shirakawa feels as if he forced it. In Japan, there is the idea of ​​"Kunshin-no-betu" for inheritance of the throne. There is a clear distinction between the Emperor and other people. The blood line is an important requirement for the condition of succession to the throne, but it does not apply to a person who left the Imperial family once. That 's why "Kunshin-no-betu" is important. In this era, people who became civilians from Prince and their descendants have existed to such an extent. Hei-shi and Gen-ji of famous samurai are their descendants. Toba-in made a dangerous choice. He recalled Prince Morihito who had once been away from the imperial family. And he made Prince Morihito the Crown Prince. The famous samurai warrior Kiyomori Taira-no and Yoritomo Minamoto-no did not say that they have the right to succeed to the throne. The choice of Toba-in has no basis to overturn it if it is told. By the way, although it is a later story, there is evidence that Muromachi shogunate third generic army Yoshimitsu Ashikaga tried to become an emperor. The next year (1156 years) after the emperor Go-shirakawa Emperor, the day after the Toba-in died, Sutoku-in wakes up a coup d'etat. It is "Hougen no ran". Kiyomori Taira-no, Yoshitomo Minamoto-no, Yoritomo Minamoto-no who will become the protagonist of the samurai politics both sideed Emperor Go-shirakawa. The result was the victory of Emperor Go-shirakawa, and Sutoku-in was expelled to Sanuki (now Kagawa Prefecture). Emperor Go-shirakawa will begin to rely on the power of samurai from here. Emperor Go-shirakawa, who lost the opponent, will take an important role in Michinori Fujiwara (Shinzei-nyudo) who was active in "Hougen no ran". Shinzei will organize the manor and promote government reform. With this, the nobility who lost the profit by the reform will be badly affected. However, Shinzei did not relax the reform. He was aiming for politics centered on the Emperor, using the power of the samurai forces. Shinzei will be the central figure that produces the internal conflict of the Emperor Go-shirakawa Gr. Emperor Go-shirakawa is the 4th year since the throne, and earnestly handed over the throne to Prince Morihito and became Joko. Insei of Go-shirakawa-in begins from here. Nobuyori Fujiwara, like Shinzei, is a person who has been assigned an important position from the Emperor Go-shirakawa, but gradually confronting Shinzei with discontent. Shinzei was seen as possessing all of his power. In addition, he will confront with Tunemune Fujiwara, Korekata Fujiwara who are the aides of the Emperor Nijo. The aide of Emperor Nijo said, "In the first place, the desire of Toba-in is politics centered on Emperor Nijo, who is not qualified as a foolish Go-shirakawa-in", begins to criticize. With this, the parent-child relationship between Emperor Nijo and Go-shirakawa-in begins to get worse. A samurai who will stand against Nobuyori Fujiwara also starts to appear. Yoshitomo Minamoto-no also participated in it. There are reasons for this. Shinzei was in a relative relationship with Kiyomori Taira-no, and he took off Kiyomori as an important position and removed other samurai. It was dissatisfied with other samurai who patronized only Kiyomori. At this point, the power of the political forces was about the same, which was not the dominance. Kiyomori also had a relative relationship with Nobuyori Fujiwara and had a distance to the Shinzei Gr and the Anti-Shinzei Gr, as well as the Go-shirakawa-in Gr and the Emperor Gr. It would have been made to be able to go to the advantageous one anytime. As a situation it was in a state of three-sides. In 1159, Nobuyori Fujiwara and Yoshitomo Minamoto-no will serve soldiers to defeat Shinto. It is the beginning of "Heiji no ran". Go-shirakawa-in Gr's Shinzei Gr will be swept away and Shinzei will commit suicide. Nobuyori Fujiwara ensured the character of Go-shirakawa-in and Emperor Nijo and forbade them. But the situation suddenly changes. This time, Nobuyori Fujiwara is crushed by Emperor Nijo Gr. The action of Go-shirakawa-in at that time is amazing. Details are in "Heiji no ran". 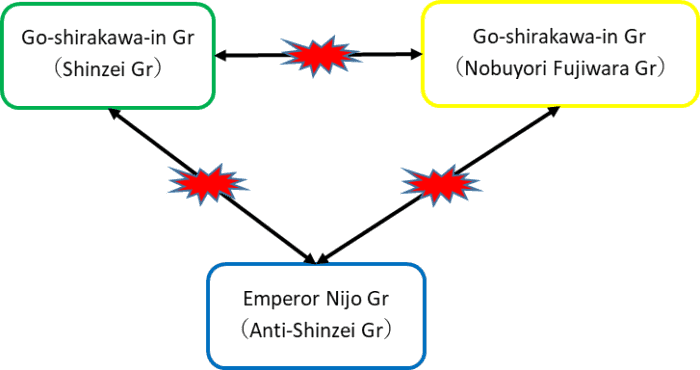 The behavior of Go-shirakawa-in at "Heiji no ran" has similarities with the subsequent actions and acts in almost the same way of thinking. To put it simply, it is "to quickly recognize that it will benefit, act without hesitation, and choose the means at that time". That is why the political forces survived for a long time in a rapidly changing era with a powerful aristocrat -> Joko's Insei -> samurai. However, I think that few people sympathize with this person. It can not be at least a hero. This area probably has low history evaluation. Go-shirakawa-in is "Heiji no ran", and succeeded in purging Anti-Shinzei Gr. Because Emperor Nijo is also Anti-Shinzei Gr, he has succeeded in crushing the Emperor Nijo Gr as a result. The forces against Joko are now gone. So I will deepen my relationship with Kiyomori Taira-no. From the perspective of Kiyomori Taira-no, it seems that the 17-year-old Emperor Nijo did not depend on it. He seemed to think that it would be more profitable to deepen his relationship with Go-shirakawa-in who had demonstrated his political power as Joko. Go-shirakawa-in which "Heiji no ran" almost lost his ally, is even closer to Kiyomori Taira-no. In 1165, Emperor Nijo abdicated for reasons of illness. Go-shirakawa-in did not object. "Heiji no ran", the main character of the Emperor Nijo Gr has already lost, but there is a remnant party. Since the battle has just ended, Go-shirakawa-in will have avoided unnecessary conflict. Emperor Nijo dies at the age of 23 in the same year. Next Emperor Nijo's son, Emperor Rokujo, became a crown prince before becoming one year old, and throne to the Emperor on that day. Go-shirakawa-in approves. Go-shirakawa-in was probably thinking of consolidating his ground carefully rather than contesting the remnants of the Emperor Nijo Gr. Go-shirakawa-in and Kiyomori Taira-no use each other to strengthen each other's power base. In 1167, one year before the withdrawal of Emperor Rokujo, Kiyomori Taira-no became Dajo-daijin and in the following year he will become a Buddhist. Dajo-daijin is the highest ranking position at the time. The power of Go-shirakawa-in reached the peak. Emperor Rokujo is a four-year ruler, retires at the age of five and becomes Joko. And he will succeed to the next Emperor Takakura, the son of Go-shirakawa-in. When Emperor Takakura crowned, he was 8 years old. Naturally the guardian is the father Go-shirakawa-in. With this, Go-shirakawa-in has completely controlled the authority inside the government. Go-shirakawa-in has been reinforcing his Insei at the same time as suppressing the Emperor Nijo Gr by abandoning his grandchild and making his son Emperor. Moreover, the mother of Emperor Takakura is Hirakiko who is the sister of the wife of Rikidaima. Kiyomori Taira-no also became a guardian of the Emperor. In 1168, when Emperor Takakura crowned, Go-shirakawa-in became a Buddhist and became a pope. Kiyomori Taira-no is the first samurai to get the best position. However, Kiyomori 's power expansion will not stop. It is not fun to do from Pope Go-shirakawa. Gradually the two will confront each other. In 1177, after 10 years since Kiyomori Taira-no became Dajo-daijin, the plaintiffs' pursuit plans of Kiyomori, which was moving with the intention of the Pope Go-shirakawa, will be known to Kiyomori. It is a conspiracy called "Shishigadani-no-bougi". Narichika Fujiwara, Saikoh, Shunkan who participated in the conspiracy were exiled to Kikai-ga-shima. Pope Go-shirakawa pretends to be unknown with his usual sharp sense ability, but the relationship with Kiyomori suddenly deteriorates. Two years later, in 1179, Shigemori who succeeded as the son of Kiyomori died. Pope Go-shirakawa confiscated Shigemori's territory and made it his own. Kiyomori, who was furiously angry with this, led the thousands of troops to advance to Kyoto, and the pope was obstructed by Toba-den. Then stop Insei of Pope, make a son born between Emperor Takakura and Tokuko daughter Emperor (Emperor Antoku), and Takakura-in go to Insei only for the nominal duty and control the real power. Here, for the first time in Japanese history the samurai regime was born. At the same time, Pape Go-shirakawa was totally defeated. Pope Go-shirakawa is a person who politicized using the samurai for the first time, regardless of human nature, who left a great achievement in history in that it caused the creation of the first samurai regime in Japan. Let's see. Mochihito-ou who was defeated by the emperor's battle with his brother Takakura-in in April 1180 when Emperor Antoku crowned, armed up with Yorimasa Minamoto-no. They aimed to overthrow Hei-shi which is a family of Kiyomori Taira-no. Although the armed uprism fails, the mind of anti Hei-shi is gradually spreading. Two months later, in June, Kiyomori pushed by the anti Hei-shi momentum will try to pull Pope Go-shirakawa, who had been frightened, to a friend again. Pope Go-shirakawa got on this. Kiyomori will move to Fukuhara (present Hiroshima prefecture) with Emperor Antoku and Takakura-in due to the capital from Kyoto to Fukuhara. In 1181, when Takakura-in died and Kiyomori passed away, the forces of Hei-shi began to decline sharply. Emperor Antoku decided to lose two guardians at the same time. Pope Go-shirakawa returning to Kyoto resumes Insei. Here the Pope takes actions with a keen sense of perception. It abruptly approaches Gen-ji who lost to "Hougen no ran", "Heiji no ran", completely abandoning Hei-shi. At that time Gen-ji, the most vigorous, was Yoshinaka Kiso. Yoshinaka becomes a cousin of Yoritomo and Yoshitsune brothers. This Yoritomo and Yoshitsune brothers will be the most famous and active samurai later in the year. In 1183, when Yoshinaka attacked Kyoto in cooperation with the Buddhist monk of Eizan, Pope Go-shirakawa will support it as soon as possible. Hei-shi had already returned to Kyoto from Fukuhara, away from the Kyoto along with Antoku and the three sacred treasures, now that run away to the west. Three sacred treasures are three tools that have been handed over from Emperor to Emperor in turn. It is being handed down to the present Emperor and is in a proper place. However, Yoshinaka was unpopular from the people in Kyoto. It is because it is just too rough. This will lose trust in Kyoto at a stretch. Pope Go-shirakawa again demonstrates its sharp sense of ability, approaches Yoritomo, brings Yoritomo 's younger brother Noriyori and Yoshitsune to Kyoto, let them destroy Yoshinaka. It is a splendid position change. From Hei-shi where value of use ceased, we moved to Yoritomo who will make the next era. At this time, the Pope already ordered Yoshitaka, Yoritomo, to kill Hei-shi. When Hei-shi is destroyed in Dannoura (present Yamaguchi Prefecture), Yoritomo Minamoto-no aiming to establish a new samurai regime and Pope Go-shirakawa will confront. The Pope gets a post office to Yoshitune Yoritomo's younger brother and plans the internal division of Gen-ji. And he orders Yoshitsune to beat Yoritomo. However, this ends in failure. When the Pope is protested to Yoritomo, in reverse this time, he orders Yoritomo to beat Yoshitune. With this, Yoshitune is driven to Oo-shu (current Iwate prefecture) and is killed along with Musashi-bou-benkei (Buddha monk) at Oo-shu. Here, Yoritomo leads the samurai under the Pope, establishing a system to handle Japanese military police. The foundation of the Kamakura shogunate is completed. 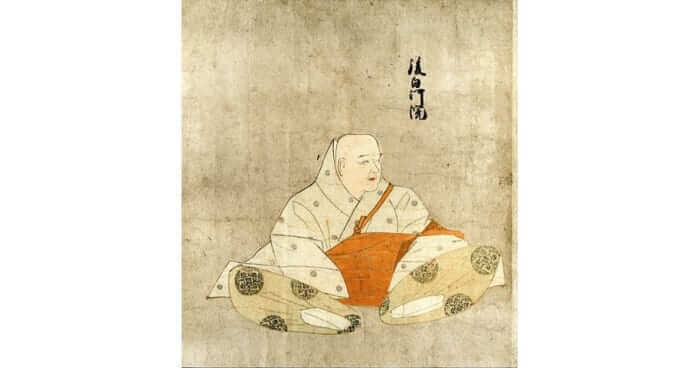 Yoritomo Minamoto - no has evaluated Pope Go-shirakawa as "the biggest tengu in Japan". Speaking of Tengu in modern sense of ours, it means "Monster". That would be that it was a formidable opponent for Yoritomo who he could not move as he wanted. That big tengu also died in 1192. The year of 1192 notices that Japanese people are at once. Formerly the year when the Kamakura Shogunate was established and the year written in the school textbook. Until the Pope died, he never gave the position of the Shogun General who wanted Yoritomo the most. It is proof against the samurai administration until the end. I will leave the detailed story to another post about the establishment of the Kamakura Shogunate, but I personally dislike Pope Go-shirakawa. But without this person, the samurai could not grow as a political power and the samurai could not take power. Also, it is a historical fact that the government of Shogunate was not born with its unique political power system. I think that 1192 is the most correct year of the Kamakura Shogunate formation. Again, I think that the evaluation of Emperor Go-shirakawa of Toba-in and Sutoku-in was not fair because personal emotions were included. The Pope who did all this alone will not see another example. Under Go-shirakawa-in's Insei, the five emperors became an extraordinary long-term regime to be ranked. Even in the Insei period alone it will last for 34 years. Pope Go-shirakawa is also famous for having visited temples shrines thoroughly. Currently, there are Ima-kumano shrine and Ima-hie shrine in Kyoto city. This is what the Pope initially started to visit in Kyoto without having to go to the distant Kumano and Hiyoshi (present Wakayama prefecture). Also, the lost court events are reviving. In addition, he has a merit in terms of art and culture. Unlike the court, the pope liked the art of the people. He collects Imayou and compiles "Ryoujin-hisho". The Imayou, that of song that expresses separated the 13 characters of the Japanese to 7 characters and 5 characters, was in vogue at the time. The songs collected here are divided into Buddhist songs, shrine songs and popular songs. This is expressed in each of the popular wishes and longing of those days. With this, we can understand what the sensibility of the people at the time is. After all, you can see that the evaluation of "no ability and no artistic talent" is a mistake.